If (when) the Jazz win tonight and then beat the Lakers in Game 7 in Tinsel Town, this series will go down as one of the greats in Jazz history. It will also take its place in a long line of historic Jazz - Lakers battles. In honor of that fact, I give you a story about a Jazz - Lakers series from days gone by. Here it is as told by Mark Eaton on the Legends of Basketball Blog. The playoff series with the Jazz and the Lakers is very similar to a series I played in 1988. We beat Clyde Drexler and the Portland Trailblazers on a Friday night, and 36 hours later found ourselves at the fabulous Forum in Los Angeles taking on the defending World Champion Los Angeles Lakers. We lost Game 1 by 12 points and were feeling pretty low when we walked back to the locker room. 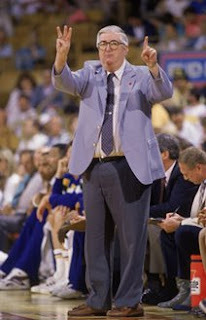 However, our coach, Frank Layden, had a plan and employed an unusual strategy. While we sat there waiting for a tongue lashing, Frank approached the situation with a completely unorthodox approach. He walked into the locker room and closed the door behind him. He looked at us all sitting in our chairs and said, ‘Guys that was a tough one, and here’s what we’re going to do next. I am going to close the locker room to the press.’ Now, in the NBA at that time, it was a $10,000 fine to close the locker room to the press. This was a very bold move. Next he said, ‘You guys are going to take a shower and go out the back door to the bus. I am going to go out in the hallway and tell the press that the Lakers are simply the greatest team I’ve ever seen and that we have no business being out on the court with them.” Karl Malone and I looked at each other and just shook our heads. What is he thinking? Has he lost his mind? Then Franks said, ‘On Tuesday night, we’re going to come back and kick their rear ends.’ All of a sudden we started smiling at each other. This is starting to get pretty funny. We jumped in the shower and went out to the bus. The press was infuriated that they couldn’t speak with us, and Frank got some major air time as the media lambasted him for closing the locker room. He had a little smirk on his face as he got on the bus! We came back on Tuesday night and took care of the Lakers. In fact, we won Game 2 and Game 3. It was a brilliant strategy. I asked Frank years later when he thought of that strategy. Was it during the game? No, he told me he thought it up while he was walking back to the locker room! Apparently, to be a great coach you have to be able to think on your feet!